Individuals with PTSD often present to treatment with life-threatening behaviors and multiple, severe comorbid conditions such as personality disorders, dissociative disorders, substance dependence, eating disorders, and mood disorders. In fact, 66% of individuals with PTSD have two or more comorbid disorders and up to 30% attempt suicide. 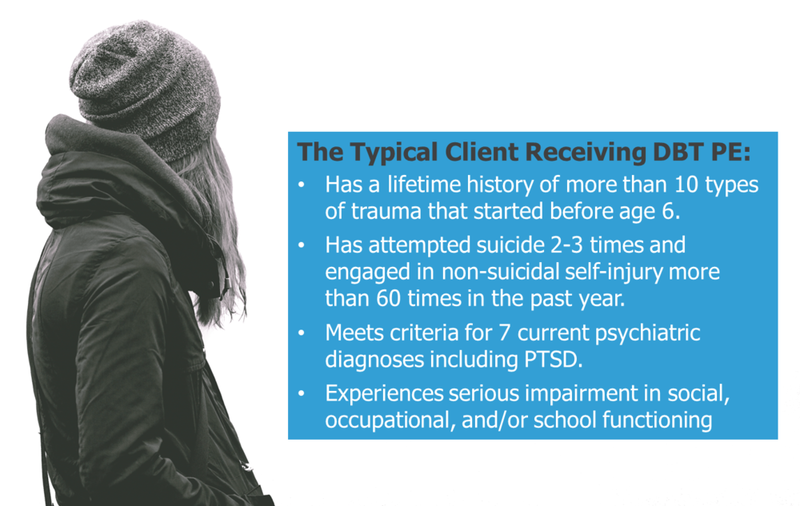 Unfortunately, these types of high-risk and multi-problem clients are often excluded from PTSD treatments due to their severity, and treatments designed for this population such as Dialectical Behavior Therapy (DBT) have not typically targeted PTSD. When not treated, PTSD increases the risk of suicidal and self-injurious behavior and is likely to interfere with achieving recovery. The DBT Prolonged Exposure (DBT PE) protocol was developed by Dr. Melanie Harned specifically to treat PTSD among high-risk and multi-problem clients who are receiving DBT. The DBT PE protocol is based on Prolonged Exposure therapy and was adapted to fit the needs of this complex client population. DBT with the DBT PE protocol is a comprehensive treatment designed to help these tremendously suffering individuals recover from trauma and build lives they experience as worth living. DBT + DBT PE is delivered in three stages, with Stage 1 using DBT to achieve behavioral control, Stage 2 targeting PTSD via the DBT PE protocol, and Stage 3 using DBT to address any problems that remain after PTSD is treated. Stage 1 DBT is delivered without adaptation with the goal of helping clients to achieve the stability and skills necessary to safely and effectively engage in subsequent PTSD treatment. Clients must meet specified, principle-driven readiness criteria to begin the DBT PE protocol in Stage 2, including a requirement of abstinence from all forms of suicidal and non-suicidal self-injury for at least two months. The DBT PE protocol is an adapted version of Prolonged Exposure therapy that uses the core procedures of in vivo exposure to feared but objectively safe situations and imaginal exposure and processing of trauma memories. The DBT PE protocol includes three treatment phases: Pre-Exposure (2-3 sessions), Exposure (flexible number of sessions), and Consolidation and Relapse Prevention (1-2 sessions). On average, the DBT PE protocol has been started after 20 weeks of DBT and lasts 13 sessions. The integrated DBT and DBT PE protocol treatment is intended for adolescents and adults with PTSD who require stabilization prior to engaging in trauma-focused PTSD treatment. 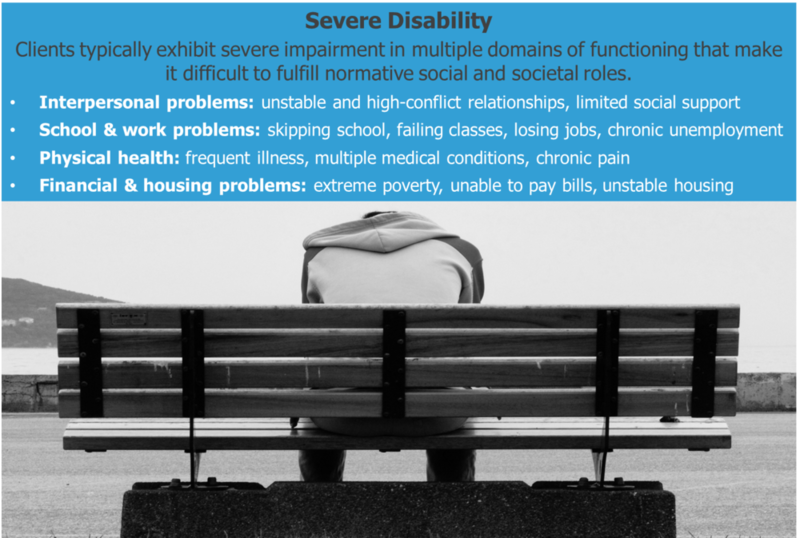 In DBT, these clients are defined as having a Stage One level of disorder that is characterized by life-threatening behavioral dyscontrol, multiple mental disorders, behaviors that make treatment difficult, and severe disability. The treatment is delivered in 3 stages. Stage 1 consists of standard DBT including weekly individual therapy, group skills training, therapist consultation team, and between-session phone coaching. The focus in Stage 1 is on helping clients achieve control over life- threatening and other severe behaviors, and increasing behavioral skills in the areas of emotion regulation, distress tolerance, mindfulness, and interpersonal effectiveness. Once clients have achieved sufficient stability, Stage 2 focuses directly on treating PTSD. The DBT PE protocol is delivered in weekly 90-120 minute therapy sessions while clients continue to receive all modes of standard DBT. Once the DBT PE protocol is complete, Stage 3 uses standard DBT to address any remaining problems in living. Often the focus of Stage 3 treatment is on improving relationships and increasing productive activities such as work or school. Avoidance is a major factor that maintains PTSD and prevents recovery. There are two ways that people with PTSD typically avoid. The first is trying to push away memories, thoughts, and feelings about the trauma. The second is avoiding situations, people, and objects that are reminders of the trauma. Although avoiding trauma-related thoughts and situations works to reduce distress in the short run, it actually prolongs and intensifies post-trauma reactions in the long run. The DBT PE protocol aims to help clients stop avoidance and instead confront trauma- related thoughts and situations so that trauma can be effectively processed. To do this, the DBT PE protocol uses two types of exposure. Imaginal exposure involves revisiting the traumatic experience in one’s imagination and describing it out loud during therapy sessions. This is followed by processing of the trauma-related emotions and thoughts that are elicited by the imaginal exposure. Imaginal exposure and processing are very effective in reducing trauma-related symptoms and helping to gain new perspective about what happened before, during, and after the traumatic events. In vivo exposure means confronting avoided situations “in real life.” Clients are asked to gradually approach safe situations that they have been avoiding because they remind them of the trauma, are believed to be dangerous, are previously enjoyed activities that have been stopped due to depression, or elicit unjustified shame. In vivo exposure has been found to be very effective in reducing excessive fears and behavioral avoidance after trauma. "I just really feel like I was able to get down to my core issues that I was never able to get down to before. I'm at peace about that now because of what I've learned...related to my trauma. It explained to me why it happened and now I know why I got so screwed up. Now it's just about accepting." "Having the base of DBT in place before starting the PE was really incredibly helpful. I think either one by themselves would've been good, but [DBT alone] would've really left a lot of things unaddressed, like my PTSD and a lot of issues surrounding that." Dr. Melanie Harned began developing the DBT PE protocol in 2005 and received a grant from NIMH in 2009 to formally develop and test the treatment in an open trial and a pilot randomized controlled trial. In 2015, she was awarded a second grant from NIMH to evaluate the effectiveness of the treatment in public mental health settings. In 2015, Dr. Harned also received the Research Award from the International Society for the Improvement and Teaching of DBT for her research on DBT PE. In 2018, Dr. Harned was awarded a third grant from NIMH to prepare to conduct a large-scale hybrid effectiveness-implementation trial of DBT with the DBT PE protocol in routine practice settings. Dr. Harned is currently a Psychologist and Coordinator ofthe DBT Program at the VA Puget Sound Health Care System and a Senior Research Scientist in the Department of Psychology at the University of Washington. Dr. Harned has previously worked as the Research Director of Dr. Marsha Linehan's Behavioral Research and Therapy Clinics at the University of Washington (2006-2018), Director of Research and Development for Behavioral Tech, LLC (2014-2017), and Director of Behavioral Tech Research, Inc. (2013-2016). She has published extensively on topics related to DBT and DBT PE and regularly provides training and consultation in these treatments in the U.S. and internationally. Dr. Harned is a licensed psychologist in the state of Washington, a certified DBT therapist, PE therapist, and PE supervisor, and is board certified in Cognitive and Behavioral Psychology by the American Board of Professional Psychology. Click here for Dr. Harned's curriculum vitae.